Until it was recently outed, China had its very own BBC News. Business Broadcast of China, a Chinese news outlet headquartered in Hefei, Anhui Province, used to have a website with a red page header and layout that was very similar to iconic British Broadcasting Corporation’s website, according to various reports in Hong Kong and Taiwan Chinese language press. The Chinese BBC site even featured reports on the “rise of financial technology, migrant labor in Germany, and the vagaries of the Chinese economy,” which are topics that the British BBC would carry, according to the LA Times, which first reported the news in English. The Chinese BBC even briefly ran an article on the Panama Papers, a massive collection of leaked documents that implicated top politicians worldwide, but omitted the Chinese Communist Party elites there were identified as having relatives who owned or still own shady offshore shell companies. 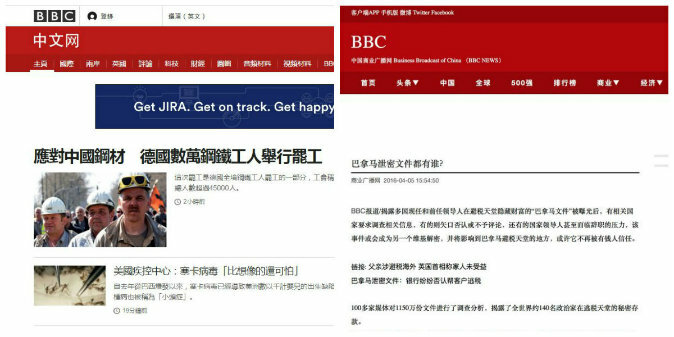 After being called out for being a British BBC look-alike, the Chinese BBC changed its BBC red header to white, but kept its logo as white words on a black background. All global and economic news have also vanished from the Chinese BBC website, leaving only China news. Recent articles in the Chinese BBC website have taken the form of childish insults—one article lists other “well-known BBCs” including a song by American rap artist Jay-Z; another article features crude cartoons and profanity aimed at the Hong Kong and Taiwan press; while yet another piece aimed at mocking a prominent Taiwan publication comprised only screenshots. On China’s popular Sina Weibo microblog, Chinese netizens got creative in their criticism. “CNN, China National News,” wrote “Qi Bohong” from Guangxi. “This is nothing. There is also a fake AFP,” wrote “Small Potato LP” from Shanghai, uploading a picture as proof. The fake AFP website has been taken down at the time of writing. Chinese companies have leveraged off well-known international brands to make their products more marketable—earlier this month, a Chinese company was found to have been using US presidential candidate and businessman Donald J. Trump’s name to sell toilets for over a decade.